“Wow! 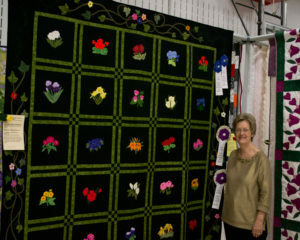 What an amazing Guild we have!”, stated Allison Holdaway, Piece and Plenty Co-Chair for the 2017 Ozark Festival of Quilts Show. It was a HUGE success! Congratulations to all our ribbon winners! Brenda Morton’s “Brenda’s Flower Dance” won Best of Show award from our judge, Kathy Eubank. The Viewer’s Choice was a tie between Liz Rowden and Brenda Morton, with May Black receiving Honorable Mention. The beautiful Crimson Star raffle quilt was won by Jill Capps of Salem, MO, and the Opal 360 Husqvarna sewing machine donated by Uniquely Yours Quilt shop of Rolla, was won by our own Ina Rea Bicknell. Ina Rea Bicknell, our lucky winner! The Piece and Plenty Quilt Guild meets the first Thursday of every month at the First Presbyterian Church: 919 Tenth Street in Rolla. The meeting starts at 7PM and doors open at 6:30 PM. Guest are always welcome at the meetings. At the upcoming November meeting the guild will host speaker Carol and Ron Elmore of Manhattan, Kansas with a presentation about Ida Eisenhower quilts and the Eisenhower family. A Free Beginner’s Class will be offered to anyone interested. The Class will be held October 28th at Stitch Niche Quilt Shop, Rolla. For more information contact Kathy Stack, President.